Mu Shu and I approve. We wish more stores would step up and care for the flower beds and trees outside their front doors. Thank you, Starbucks! You may be an overpriced, overexposed chain store, but you got the flowerbed thing right. 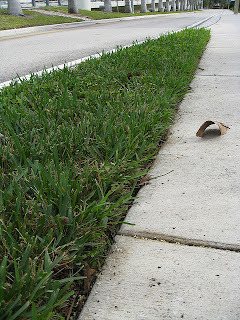 By the way, what do you call the strip of land--often grassy--between the street and the sidewalk? I've always called it the "Devil's Strip." The Hubby thinks this is odd; he's never in his life met somebody who calls it this. Me: Whatchoo talkin' 'bout? Lots of people call it the Devil's Strip! The Hubby: Really? Name one. The Hubby: You learned it from THEM! The Hubby: They learned it from YOU! Yesterday The Hubby called me to say he'd gone online and learned that, according to the Urban Dictionary, the "Devil's Strip" is a term unique to the area around Akron, Ohio. I went online and found a little website called "Summit County Myths" that insists it's not true. It's actually a term unique to a larger part of Ohio. Yours Truly grew up in Dayton, Ohio, from the age of three years until I was six. Before I was born, my folks lived in Dayton for a number of years, too. My guess is they picked up the phrase from the locals, and it became part of our family's vernacular. So long as it's planted with flowers, I don't care what you call it. You learn something every day...I don't remember ever hearing that term, in spite of the two stays in Ohio. Thanks for doing the research and providing an interesting bit of trivia!